Avtec’s Ultimate Security Hosting platform now offers direct integration with Avtec Security Monitor, the leading website security scanning service. Our customers take their web hosting seriously and expect quick, knowledgeable service from a provider that is familiar with their hosting needs. With Avtec, you’ll have the peace of mind of knowing that we are constantly monitoring your server. Security Scanner scans your website to find malicious software (malware) before it can harm you or your members. Hackers insert malware onto legitimate websites in order to steal customer passwords and credit card numbers, deface or destroy the website or use your server to launch attacks on other websites. 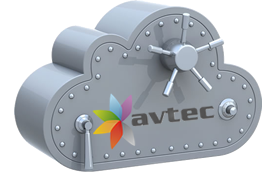 The Avtec Security Monitor is the gold standard for identifying potential compromises to your hosting environment. Detailed and easy-to-read monthly reports provide a simple and up-to-date log of potential threats with suggested recommendations. With licensing and updating taken care of, you are free to focus on building your environment with the ultimate peace of mind.